The past few days, Snapchat has been launching a new feature that lets other people find out exactly where you are at any given moment. Snap Maps lets you and your friends share your location in real-time, with frightening accuracy right down to the street you're on. The map will also show your friends, and group your friends together, if they're close enough that it seems like they're possibly doing something together. Unsurprisingly, parents are already concerned about the feature. “Snapchat has introduced a new tracker in the update where you can view the exact location of your friends,” reads a viral post by parent Pat Ramsey. “It can give you the area, town, and street and if you zoom in enough, it shows the house on the street layout." And younger social media users have their concerns too, although it's for a far different reason. them:"......snapchat says u home tho?" Girlfriend: You home yet babe? If you'd rather not have people trace your every step, you can opt out. To do this, open Snapchat and pinch the screen as if you were zooming out. 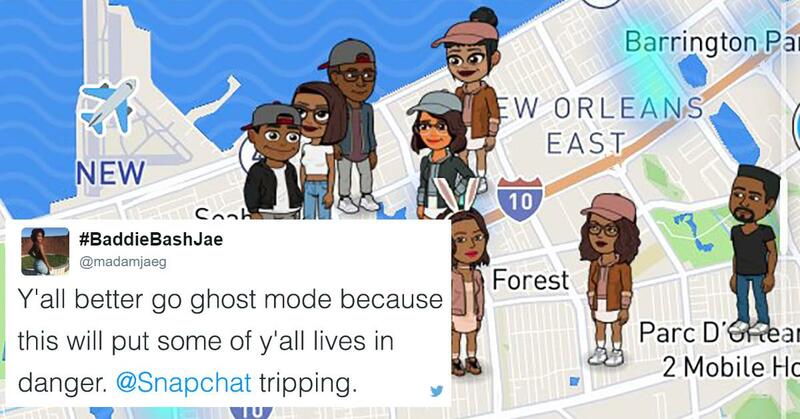 This will launch Snap Maps, and if it's your first time opening the new feature, you'll be given the chance to enable ghost mode. You can enable or disable ghost mode at any time by clicking the gear icon in the top right corner of Snap Maps.